The original plan was macaroni and cheese, but my kids insisted I make chicken pot pie instead in honor of Pi Day. We had apple pie for dessert. Yum! Anytime someone in our household has misplaced an item and mentions it, the result is usually a spontaneous rendition of "Where is My Hairbrush" from VeggieTales. The history of VeggieTales in our house goes way back. In fact, it goes so far back that I remember the first release, which was the beginning of our entire VHS collection (yes, VHS!). Our collection is now long gone, but my kids still reference VeggieTale jokes and belt out an occasional VeggieTales tune (Madame Blueberry's "I'm So Blue" is quite popular, too!). When the opportunity to review The Little House That Stood presented itself, I couldn't help but get a little excited - even though my youngest is a teen! I won't call out which one, but one of my kids requested to watch the movie the day it arrived, giggling through the whole thing. I love that the VeggieTales movies always have plenty of quirky jokes for the over 12 audience. I have to admit I might have giggled through the "Happy Toothday" Silly Song by Larry the Cucumber (though "Where is My Hairbrush?" is still my favorite). If you'd like to take the movie beyond 49 minutes of giggles and quiet time (for either you or the kids, depending on how you look at it! ), the website has coloring pages to download and a discussion guide. There are also some clips of the movie to preview, including Larry's Silly Song "Happy Toothday". The Little House That Stood is an adorable merger of fairy tales and Bible parables to teach kids about decision making. 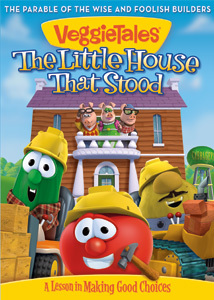 I'm excited to be able to offer my readers a chance to win a copy of VeggieTales' The Little House That Stood! Enter the giveaway below!